No caps on usage. No charge for overages. You also have the choice of synchronous and nonsynchronous service. Synchronous internet has the same upload and download speeds. Nonsynchronous internet has different upload and download speeds. 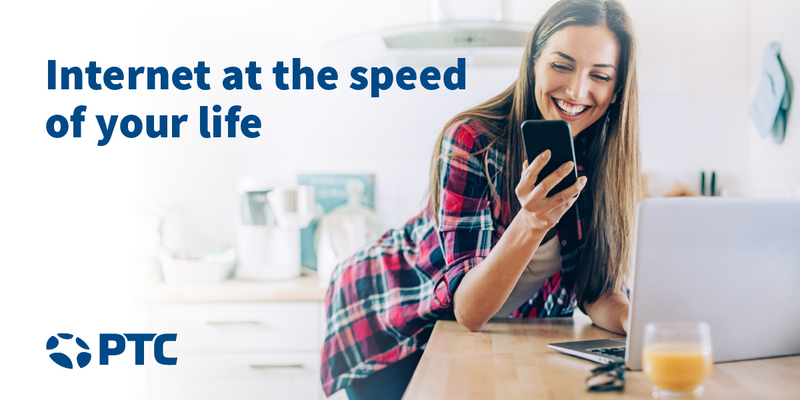 Higher speeds are only available on our extensive fiber network. Site survey is required for all new customers and upgrades to determine maximum upload and download capabilities. * Internet w/ Voice pricing is for internet only – does not include cost of voice services. Free replacement of the Gateway as long as the program is in force, assuming normal wear and tear. A gateway routes data from place to place, just like a router, but in a more efficient and specific manner depending on the type of data being routed. Gateways also generally allow for other media connection types (like USB & VOIP Ports) and act as the “central” component in an integrated voice, video, and data network. A gateway puts more intelligence and control into the consumer’s home. Networking setup for all existing voice and data connections. Time & Materials will be charged for new wiring. WiFi Mapping – This service is normally $29.95 and uses advanced technology to assess the optimal location of the gateway in order to give you the very best WiFi coverage possible.